Having a good PR strategy in place is vital for establishing a strong presence in the retail electronics market. BuyItDirect.co.uk is one of the UK’s leading online retailers, and was one of the first companies to sell laptops online. The group operates a range of websites specialising in laptops, TV’s, kitchen appliances and flat pack furniture. This includes LaptopsDirect.co.uk, AppliancesDirect.co.uk and Furniture123.co.uk. The brief was to increase search engine visibility-boosting and brand awareness for the AppliancesDirect.co.uk and LaptopsDirect.co.uk website during Black Friday. We commissioned a series of press releases which highlighted the best Black Friday Deals from both websites. Having a good knowledge of the media, allowed to secured excellent, quality coverage. For example, we were able to engage with journalists at media titles which were ranking the highest in Google search rankings. 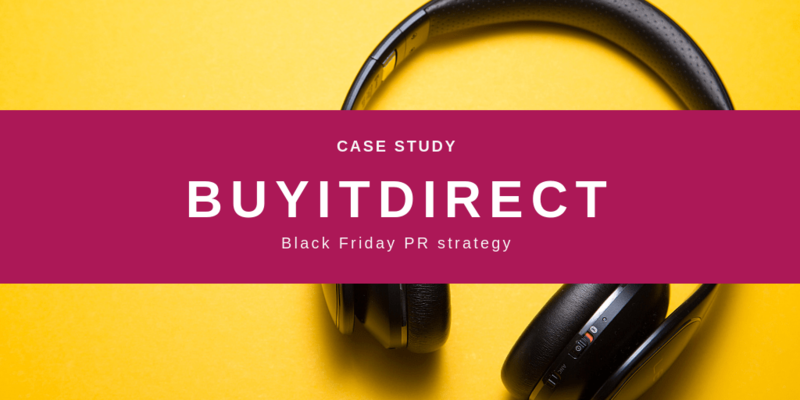 In addition, Google Analytics data allowed us to identify the media outlets which were able to drive the highest volumes of sales for BuyItDirect, and target these specific journalists.